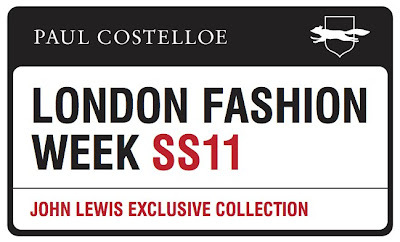 Marvel and firm favourite on the British fashion scene, Paul Costelloe is celebrating his show at this month's London Fashion Week by opening a pop-up store in the John Lewis flagship store on Oxford Street, London. The pop-up store will open directly after Costelloe's fashion week show and the man himself will also be in attendance. It will host the Costello Catwalk Collection which is a 25 piece range from the SS11 Paul Costelloe Man collection which opened last season's fashion week with a BANG! Only ten pieces of each item will be made so this really is an exciting chance to get your hands on a unique piece that won't be reproduced. The pop-up store will be open for two weeks from 18th February but I would get there sooner rather than later as these pieces are sure to sell out faster than a model down a runway (excuse the fashion week reference, I couldn't resist). Ha! In due time my dear. In due time. Only two weeks left!